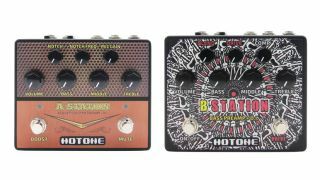 Hotone is best known for its mammoth catalogue of tiny pedals, but its new A and B Station preamps take a more fully featured approach. The A Station provides a preamp for both guitar and microphone, with XLR ins and outs, as well as 1/4" jack DIs, offering a three-band EQ, plus a feedback-busting notch filter, effects loop and mute switch. Phantom power is also onboard for the mic input, while a boost footswitch ups the volume for solo moments. The B Station, meanwhile, is aimed at bass players and provides a three-band EQ, blendable drive channel and one-control compressor for quickly honing tone. It also features an XLR DI out, headphones out, ground-lift function and FX loop for integrating other effects. Both pedals are powered by a 9V battery or power supply, and will be available "soon" for £129.99/€149.99 each.